Huawei has now arrived to the phablet party in a size that rivals the Galaxy Note II. Along with the Ascend D2, Huawei’s flagship device, the Ascend Mate has been announced at the Huawei CES press conference. 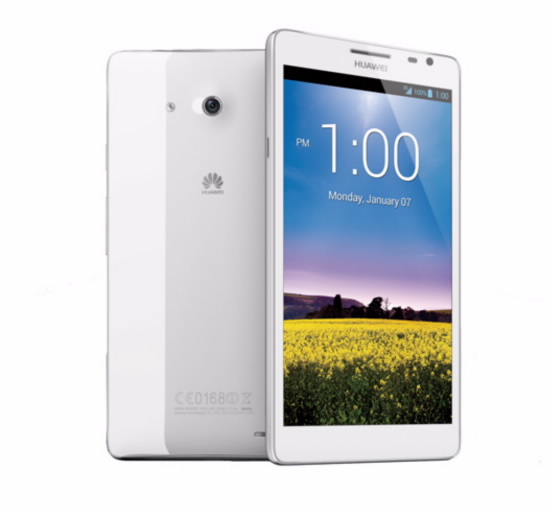 The 6.1 Ascend Mate has a 720p screen and the same K3V3 1.5 GHz quad core processor that is produced in house, by Huawei. And even more amazing is the fact that the gigantic 6.1 inch display is supported by a huge 4050 mAH battery. This is Huawei’s answer to the Galaxy Note II, well, at least that category of devices. Huawei is pimping the battery as a major USP of this phone and we kinda agree, 4050 mAH is huge capacity, even for a screen that huge. Huawei says that it will last you 14 hours of continuous web browsing, 22 hours of chatting or 10 hours of video. This probably means that the Ascend mate will easily last for a day. On stage, the dual WiFi receivers were also demoed, with an impressive 150 Mbps download speed. Few of the apps were demoed, which include a camera based navigation app dubbed the “Guiding wizard”. The phone has “Magic touch” technology which means it can be used with gloves on, much like the super sensitive Lumia 920 screen. There are also apps and options to look up words instantly using “Smart reading” and a very familiar looking “easy panel” for quick access to notes, messaging and other similar functions. Before we forget, like the Ascend D2, the Ascend mate also runs on Android 4.1 Jellybean. The Ascend mate is slated to ship in February, initially in China. We haven’t heard from regarding global availability yet, we’ll keep you posted if anything of that sort comes by.